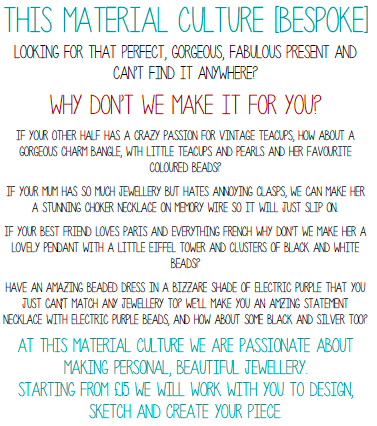 Looking for totally unique bespoke jewellery? Want something truly special? We can make it for you! Let us know your ideas via the contact form and we’ll do some sketches and get you a quote. From personalisation with initials, to totally bespoke beaded pieces in chosen colour schemes, our bespoke jewellery pieces make a truly special gift. If you just can’t find what you’re looking for on the high street, our bespoke jewellery making service is surprisingly affordable. If you have an outfit you want to match we can look at photos and send you some ideas, we’ll work all of your ideas into the piece and no detail is too small. Our process is totally transparent and you can be involved as much or little as you like. We love making bespoke pieces, it is amazing to create something beautiful and unique and match your ideas with our skills.